Welcome to the new Vibroplex Collector’s Page — don’t forget to bookmark the new location. It will be “under construction” for a while, with new material added. Thanks for your interest, and I hope you find it interesting and informative. Since Horace G. Martin made the first Vibroplex in 1904 or 1905, about 300,000 Vibroplexes have been made, and the Original model Vibroplex is still being made after more than 90 years. Vibroplexes were by far the most predominant bug on land line telegraph systems like Western Union, Postal Telegraph, the railroads, and hundreds of others. Beginning in the Twenties, commercial, military and amateur wireless operators began using Vibroplexes. Production peaked in the Fourties and Fifties along with the popularity of ham radio, but the Vibroplex Company is still making them — be sure to visit the Vibroplex Co. This Web page is intended to help owners identify their Vibroplexes, determine when they were built, and learn about the interesting company and people that made them. However, many telegraph operators who used a key for long periods of time developed a debilitating problem, which they called “glass arm.” Today the same type of problem has a kinder name — “Repetitive Motion Disorder,” or RMD. Carpal Tunnel Syndrome is one type of RMD. In 1902, Horace G. Martin, a New York inventor, patented the first semi-automatic telegraph key, which he began to manufacture as the “Autoplex.” Using a battery and coil like those in an electric bell, the Autoplex made endless strings of dots when the operator pushed a lever in one direction. Dashes were made manually by pushing the lever the other way. Since only dots were made automatically, the key was called a semi-automatic key. Unfortunately, the Autoplex required a separate battery and was probably fairly expensive. Two years later, on May 7, 1904, Martin filed a patent for a completely mechanical semi-automatic key, which he named the “Vibroplex.” The Vibroplex was based on a lever that rotated around a vertical pivot. Pushing a paddle mounted on one end of the lever to the right and holding it there caused a spring-mounted contact on the other end of the lever to vibrate against a stationary contact, making strings of dots. Dashes were made manually by pushing the lever to the left and releasing it. Martin was probably not the sole inventor of the semi-automatic key. William O. Coffe of Cleveland patented a mechanical semi-automatic key with a vertical pendulum on January 11, 1904. He must not have sold many copies of his “Mecograph” with the vertical pendulum, because only one is known to exist today. However, he made and sold a number of Mecographs in several different versions with horizontal pendulums. 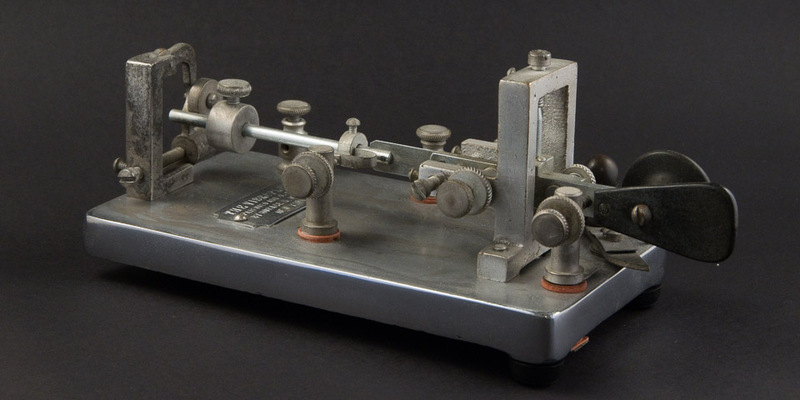 The Vibroplex did help telegraphers avoid RMD, but it also helped them send faster, which meant they earned more money, since telegraphers were generally paid by the word. Within about ten years, the Vibroplex and a number of clones made by others became very popular. The Vibroplex Company has made a variety of bugs during its long history. Some models are unusual, some are scarce, and some are common. Several other manufacturers made clones and copies of Vibroplexes, some legal and some illegal. Some of the people involved are interesting and colorful, including Martin himself and J. E. Albright, who ran the company for more than forty years, many of them spent in court defending his product. The Vibroplex Collector’s page is not affiliated with the Vibroplex Co., Inc. “Vibroplex”, “Lightning Bug” and the bug logo are trademarks of The Vibroplex Co., Inc.